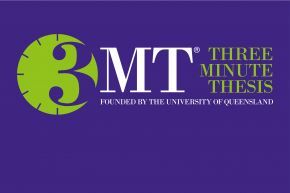 3MT® is an academic competition that challenges PhD Researchers to describe their research and its significance, in non-specialist language to a general audience, in just three minutes. Participation in the competition helps PhD researchers to build their confidence and hone their presentation and communication skills. It is also a great way for others to find out about the exciting and varied research going on across the University at doctoral level. The prize for the overall winner is £750 with prizes for the runner up and all finalists, as well as a People’s Choice Award. Participants will compete in campus-based competitions during April and early May for a place in the Ulster University 3MT Final on Wednesday 6 June 2018 hosted at the Magee campus. The overall winner of the Ulster competition will then go through to the semi-final of the 2018 Vitae 3MT national competition (online), with the chance to be selected for the UK Final! A single static PowerPoint slide is permitted. No slide transitions, animations or 'movement' of any description are allowed. The slide is to be presented from the beginning of the oration. Presentations are limited to 3 minutes maximum and competitors exceeding 3 minutes are disqualified. Presentations are to commence from the stage. Presentations are considered to have commenced when a presenter starts their presentation through either movement or speech. Did the presentation provide an understanding of the background to the research question being addressed and its significance? Did the presentation clearly describe the key results of the research including conclusions and outcomes? Did the presentation follow a clear and logical sequence? Was the thesis topic, key results and research significance and outcomes communicated in language appropriate to a non-specialist audience? Did the speaker avoid scientific jargon, explain terminology and provide adequate background information to illustrate points? Did the presenter spend adequate time on each element of their presentation - or did they elaborate for too long on one aspect or was the presentation rushed? Did the oration make the audience want to know more? Was the presenter careful not to trivialise or generalise their research? Did the presenter convey enthusiasm for their research? Did the presenter capture and maintain their audience's attention? Did the speaker have sufficient stage presence, eye contact and vocal range; maintain a steady pace, and have a confident stance? Did the PowerPoint slide enhance the presentation - was it clear, legible, and concise? For further information and queries about the 3MT competition please contact: Lisa Thompson, Doctoral Development Manager, l.thompson@ulster.ac.uk / 02890 368963. On Twitter@RaymondKWilson @theCANNproject @UlsterUniGES @AquaTT_Ireland Congratulations Raymond from all in the Doctoral College !